All over the City of Philadelphia, one can find linoleum cut-outs embedded or stuck to cross walks and the black top of our streets. I have found them mostly in Center City around Broad Street at Lombard and over to Chestnut Street; near the Art Museum and occasionally around South Street or Old City. I have also seen them in other cities - I saw one in Pittsburgh a few weeks ago. Like the "Toynbee" cut outs, I have no idea who is behind these, but I do think that it's a group effort. Typically these robot-like skeleton running figures are yellow or white, and the hands are either at the side of the body or one hand in the air. The heads have been cone shaped. This finding, at 15th and Spruce is unique; he's red, square-headed, the hand is in his "crotch" (a tribute to Michael Jackson?) and the appears to be another detail in the chest area - kind of a heart. 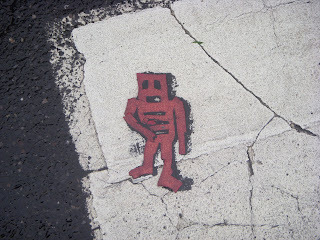 You can see further photos of my Running Man findings here at my Flickr photo site. 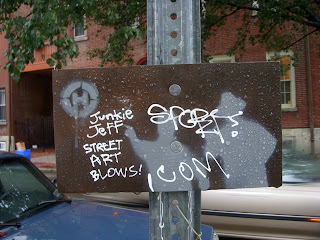 Also along the street at 15th & Spruce was another street sticker cut-out. I noticed them all along Spruce Street from 10th Street up to 15th. Most were cursive style cut-out linoleum stickers that said "GUESS". 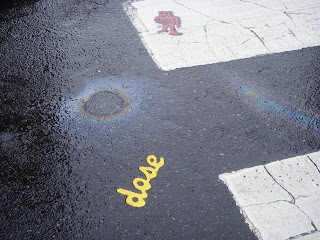 The one I found today said "DOSE". No idea what these mean. I have an inkling that these might be related to the Fringe Festival, along with last week's red shoe prints along Walnut Street. For the past two years, I've been spotting recycled art posted on street poles. CD's, skate boards, discarded scraps of wood, painted with silhouettes and characters. Usually there appears an "H" in a circle, or the initials, WTF. The greatest concentration of them happen to be in the area around South Street and Lombard, between 11 Street and Broad. Again, you can view more of these at my Flickr Photo pages here. If anyone has information about these creations, leave a comment. I'd love to learn more. I've looked up some photos on Flickr, and have viewed other collectors pictures, but haven't learned much more. These are a cross between street art and graffiti.